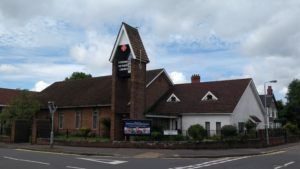 Located in east Belfast, we are a vibrant outward-looking suburban Christian community which seeks to build for the kingdom of God by declaring in word and in action the love and grace of God found in Jesus Christ. Our congregation reflects a diverse range of ages, from young children to senior citizens. We would love for you join with us on a Sunday or at any of our activities. Throughout the year we run all sorts of activities – Kidzone, Girls’ Brigade, Scouts, a weekly craft class and an indoor bowling club amongst others. Our worship services take place every Sunday at 11.00 am and 7.00 pm as opportunities to reflect, learn, give thanks and to praise through a variety of hymns and songs, old and new. A creche is available and Kidzone and Focus, for teenagers, are held during the morning service. Our bottom line is that God loves this world. He loves you and this community so much that he sent his Son, Jesus, to live, die and be raised to life again so that we could receive, and be transformed by that love. If you’d like to know more, please browse our site or better still get in touch. Rev Robin Waugh will be glad to meet you and discuss any matters you wish.